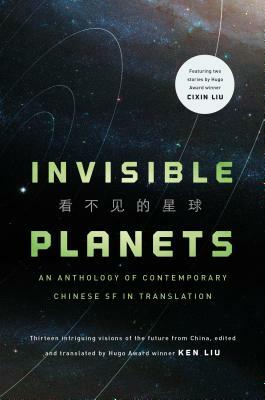 Invisible Planets, edited by multi award-winning writer Ken Liu--translator of the bestselling and Hugo Award-winning novel The Three Body Problem by acclaimed Chinese author Cixin Liu--is his second thought-provoking anthology of Chinese short speculative fiction. Invisible Planets is a groundbreaking anthology of Chinese short speculative fiction. The thirteen stories in this collection, including two by Cixin Liu and the Hugo and Sturgeon award-nominated “Folding Beijing” by Hao Jingfang, add up to a strong and diverse representation of Chinese SF. Some have won awards, some have garnered serioius critical acclaim, some have been selected for Year’s Best anthologies, and some are simply Ken Liu’s personal favorites. To round out the collection, there are several essays from Chinese scholars and authors, plus an illuminating introduction by Ken Liu. Anyone with an interest in international science fiction will find Invisible Planets an indispensable addition to their collection. For more Chinese SF in translation, check out Broken Stars. Ken Liu’s fiction has appeared in F&SF, Asimov’s, Analog, Strange Horizons, Lightspeed, and Clarkesworld, among other places. He is the author of The Grace of Kings, and has won a Nebula, two Hugos, a World Fantasy Award, and a Science Fiction & Fantasy Translation Award, and been nominated for the Sturgeon and the Locus Awards. He edited and translated the Chinese science fiction anthology Invisible Planets. He lives near Boston with his family.